Q: I’ve read some of your entertaining commentary making light of health club trainers and BOSU Balls, and understand the idea of focusing on big compound movements to develop a strength base. That being said, what do you think about trainees who have the groundwork covered and have moved on to a more advanced state? Any use for throwing in some BOSU Ball stability work for a new challenge? A: BOSU balls are phenomenal for one thing, a zippy punchline. Recently, the crew at the Journal of Strength and Conditioning Research published a study looking at the effect of instability devices in advanced trainees, and buried the BOSU even farther down in the box of useless tools (1). 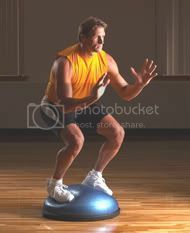 They measured EMG activity in several muscles during a variety of BOSU Ball and Dyna Disc exercises, and then compared the tests to equivalent exercise without inflatable props. The last bullet is a perfect summary. Our bodies will learn to enhance neural activation and stability just fine with normal free weight exercises, so leave the toys in day care. Q: Is there any value to the muscle fiber testing protocols based on 85% of a one rep max? And should one alter rep ranges for certain muscle groups if they show up as faster or slower twitch based on these tests? A: I used to use this testing method with new clients many years ago. I think it has some value, but not enough to keep in my repertoire for more than about 6 months of initial experimentation. A recent study investigated this concept, using the leg press with trained individuals (2). 12 trained men had a biopsy taken of the Vastus Lateralus (the outermost quad muscle), and had it analyzed for muscle fiber makeup, cross sectional area and capillary density. One week later they performed as many reps as possible (AMRP) with 85% of their 1RM on the leg press, waited a week, then did it again (2nd test for accuracy). Another week later, they performed AMRP with 70% of their 1RM. One thing that I’d like to note here (the researchers either overlooked or chose not to mention this), is that the Leg Press notoriously responds differently than other exercises to % RM testing. Many people can perform far more reps per given RM percentage than with other exercises. This bit of trivia doesn’t necessarily negate anything, although it would be interesting to see this test done on a variety of free weight exercises. At 85% of 1RM, an average person should get about 6 reps for a given exercise. 90% = 3 reps, etc. Every percentage of your 1RM has a number assigned to it that is “normal”. Those that get much higher or lower than these numbers are generally said to be dominant on opposing sides of the muscle fiber spectrum. This changes depending on the muscle group and or exercise with each individual, it’s rarely if ever constant throughout the whole body. This new study is telling us that you could have somebody crank out 8 reps with 90% of their 1RM (instead of the typical 3), and still be highly fast twitch dominant…they just have an above average capillary density. Normally this person would be deemed slow twitch dominant, or IIA dominant. Instead of spending your time training in your predetermined muscle fiber type rep ranges, it makes more sense to define your goals (strength, power, athletic performance, hypertrophy, recomposition, etc. ), and train in a variety of rep ranges with an emphasis on the priority. But even those prioritizing low reps for strength would undoubtedly gain benefit by adding in some high rep work for increasing capillary density. 1. Wahl, Michael J; Behm, David G. Not All Instability Training Devices Enhance Muscle Activation in Highly Resistance-Trained Individuals. J Strength Cond Res. July 2008. 22(4):1360-1370. 2. Terzis G, Spengos K, Manta P, Sarris N, Georgiadis G. Fiber Type Composition and Capillary Density in Relation to Submaximal Number of Repetitions in Resistance Exercise. J Strength Cond Res. 2008 Apr 15. For eTraining programs designed by Fitport, get info HERE. Click “Download Brochure” on the left side of the page for program and package pricing.